This was my first project at GA. I worked on it on week 1 and came back to it for the visual design on week 7. I had to design a rough prototype for my designated partner, Ramsay. To be able to understand who is Ramsay I had to sit down with him a few times and ask him about his interests. Ramsay is 30; he is married and lives in London. He told me that he loves cooking, eating out, hiking and doing DIY in his new house. I had to direct the interview to dig a little deeper into each subject to determinate where Ramsay had the most pain points that could not be addressed with something that already exist on the app market. For example, he first expanded on eating out, because apparently he has trouble finding new exciting places around his new house. However, all his pain points could be resolved with Yelp. We then further discussed about hiking. I love hiking to and I had a similar problem, which is that it can be tricky to find good and accessible hiking place around you. Then the conversation organically moved towards his new house, and it allows us to dig a little bit deeper into DIY. When we explored a little bit into DIY I learned that Ramsay actually loves interior design and DIY and that he could identify a few really annoying pain points with his current process to find tutorials. To be able to choose between a DIY app and a hiking app I asked Ramsey what he would prefer and he thought would be his frequency of use. It was clear to him that if he had to choose he would rather have the DIY app so we focused on that. Let me explain Ramsay’s problem clearly. You can refer to the storyboard. Ramsay just bought a new house; he loves it and he is super excited to make it even better. However, he knows that employing someone to do the work in his house is going to be expensive and he likes DIY anyway. So, he goes on YouTube to find a clear tutorial for his project. Let’s take “changing a light bulb” for example. After a while he realises that the process is really time consuming. He has trouble finding a relevant and good quality video. 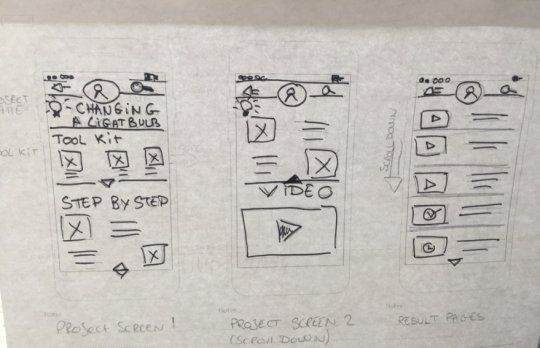 This concept map gave us a good idea of what the app should look like so I started sketching. This sketch gave me a clearer idea of what the user flow should look like, so after discussing it with Ramsay I draw a flow chart that represented the different option the user should have. This allows me to refine my UI design. This second iteration was really productive. Ramsay pointed out that he would rather have the back button at the bottom of the screen as well as the setting menu. All I needed now is to refine my sketches another time add a little colour and ask him about gesture. To recap the application was supposed to solve 3 pain points Time, Quality and Usability. The user will save a tremendous amount of time because he won’t have to scatter the internet to find a decent video everything will be in one place. Also, all the Project Pages will be constructed the same way. They all have a tool guide, a step by step process, and finally the video. The ‘How To’ will be reviewed by peers and professionals. This will be defined more in a later iteration. In the 3rd iteration I really focus on how Ramsey will use the application, in other words on the usability. The app has big, bold, colorful, icon so the user can see from a distance on which type of project he is (ex: Blue for plumbers, Yellow for electricity, and so on…). The advantage of big icons is also that they are easily clickable if you are in the middle of something. Before creating my prototype on Pop I asked Ramsey to interact with the paper prototype so I could see his gesture and flow. User: Siri, what is the second step to change a light bulb? Siri: Changing a light bulb, second step: bla bla bla. Would you like me to repeat, read step 3, or play the video Ramsey? You can try the paper-prototype here. A few weeks later I had a chance to go back to Handy Me to work on its visual design. The colours have always been a really important part of my design. They are supposed to be pleasing to the eye, but mostly intuitive. My goal was that users could recognise in which section of the app there are from a distance thanks to the colours. I needed to choose colours that meant something for my users. In order to not influence them, I gave them a piece of paper with names of my categories written on it and asked them to write the first colour that pop in their mind next to each category. That was a really good start, but some of the colours were not complementing each other really well. I started to take pictures of everything colourful around me for inspiration. The tricky part was that each color has to be vibrant enough so I could fade it for different pages. After multiple tests I finally stopped my search and found my colour palette. I was then able to finalise my style tile. Through user testing I found that the navigation was confusing, so I simplify it. Users found the access to their profile in the middle confusing. They really appreciate the back button, especially in the context of DIY work. If they had their hand full or dirty they wanted to have the choice of swiping or a minimal touch option of the button to go back. I also moved the search tool in the middle bottom to be more visible and always accessible. User feedback was positive. They like the colours and big, bright, bold interface. They find it useful, playful, and easy to use. Click here to try my prototype. Please note that it works best on a phone. This is a beta version, more screens and iterations are to come so stay tune.